A manga-sized collection featuring the classic origin and first adventures of the Swamp Thing (also collected in the full-size tpb SWAMP THING: DARK GENESIS), including the first 10 issues of the original SWAMP THING title, all by the legendary team of writer Len Wein and artist Berni Wrightson. To date, the contents of this collection (and the standard-sized version Swamp Thing: Dark Genesis) are the only issues to be reprinted from the first Swamp Thing series, which ran bi-monthly for 24 issues from 1972 to 1976. 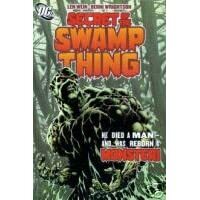 This collects Bernie Wrightson’s entire run on the series. Len Wein wrote three more issues (#s 11-13), which have not yet been collected or reprinted. The rest of the series, still to be collected, was illustrated by Nestor Redondo (issues 11-23) and Fred Castrillo (24), and written by David Michelinie (14-18 & 21-22), Gerry Conway (19-20 & 23-24) and David Anthony Kraft (24).